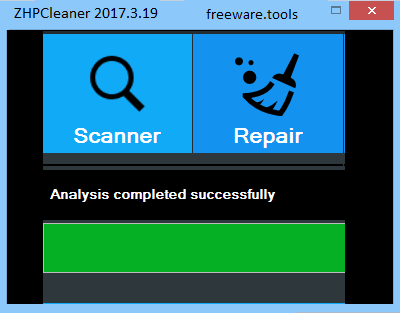 ZHPCleaner is a free portable tool which can detect and remove adware, browser hijackers, some toolbars and more. The program is very convenient to use. There's no installation, it doesn't even arrive in a ZIP file, you just download, run and hit "Scan". You might see occasional dialogs and prompts during the scan, and these aren't always straightforward. "Have you installed this server? ", the program asked, displaying a couple of IP addresses we didn't recognise. What server? ZHPCleaner didn't explain, so we clicked "No" and waited to see what would happen. Once the scan completes, the program becomes more straightforward. Whether they install unwanted toolbars, change the home page or show pop up ads randomly when you are surfing the web, adware is extremely irritating. Unfortunately, since their role is to earn money by forcing users to view ads forcefully, they can also hard to remove without some help. The program comes with a simple UI that is intuitive and should not pose any challenges.The UI consists of a small window that provides you with three tools, namely Scanner, Repair and Report. As you probably hinted, you need to perform a scan first and then access the Repair function to remove unwanted malicious software from your browser. Once the scan is complete, you are provided with a summary report and preview the PUP found. If you do not know exactly what they are or if you need them, then you can use the right click function and learn more prior to deletion. The Report tool has the role of saving the results of your last scan so that you can access it at a later date. The idea behind the application is not just to remove toolbars or annoying ads from your browser, but to find and remove all traces of unwanted components that have been installed along with them on your system. Therefore, in addition to adware, toolbars and other irritating elements that pop up in your browser, the tool removes directories, registries and all other files associated with them. All in all, if you noticed that your browser has started to run slow lately and you are getting frequent pop ads whenever you are surfing the web, then ZHPCleaner can help you determine whether you are a victim of adware and help you remove it.